The Nightlife wide jeans for women had a messed up waist. I made a default replacement that fixes it. Won't break any recolors. 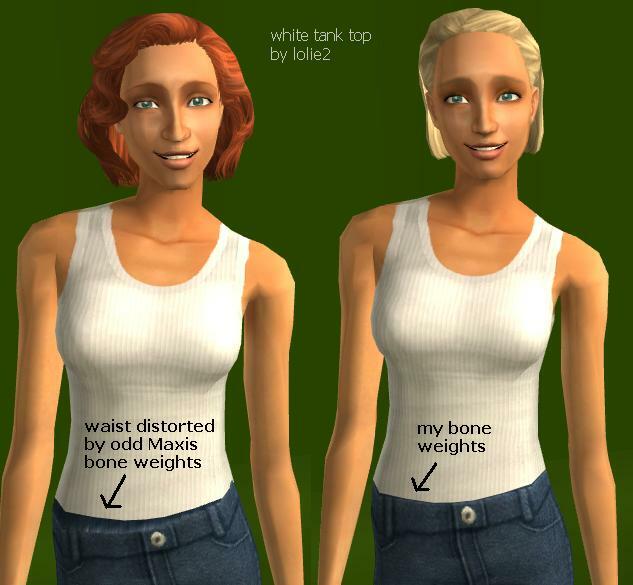 The Maxis bone weights made it move in an unnatural way. I fixed the bone weights so these pants move like other pants. The 3D ridge at the waist prevented proper "untuckability". I have removed it and made three "untuckable" recolors. 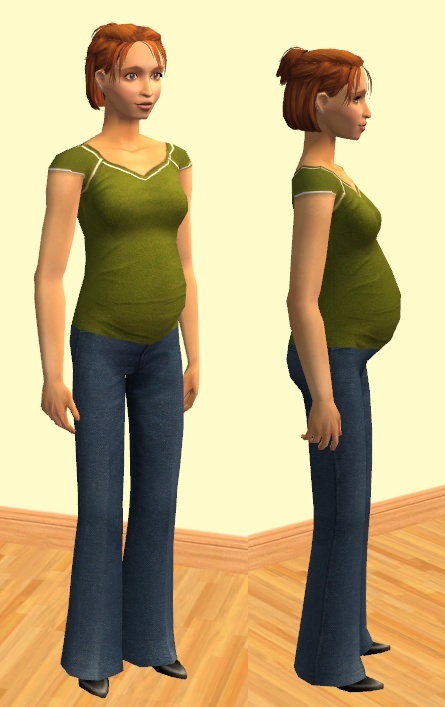 I added a pregnant morph that works with HP's untuckable shirts. Green tee recolor by lenasha. I made three untucked recolors of these pants. 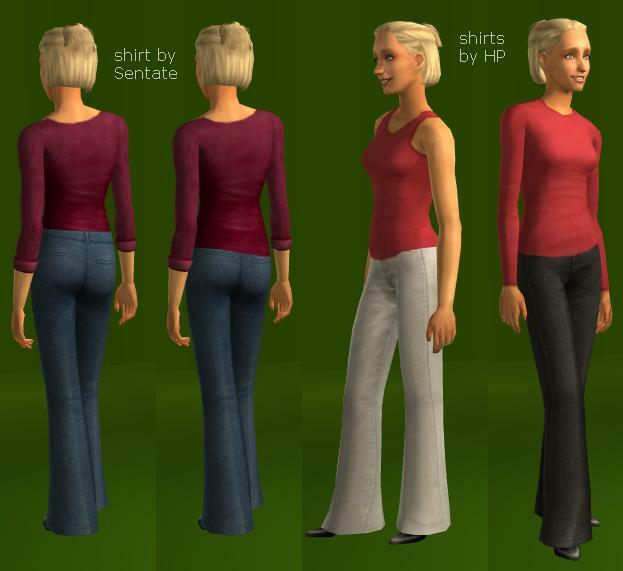 I used my Cat's UV Data Merge plugin to quickly and easily match the top of the pants UV to the bottom of HP's untucked shirt UV. You can too! 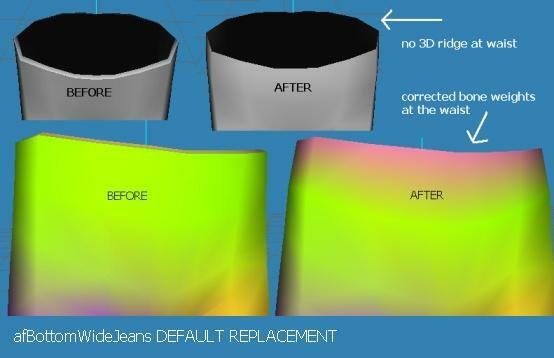 Also, you can use Cat's Normal Smoother when removing 3D ridges. - You may modify this mesh, please link here for credit. - You may of course recolor, it's a default replacement. - Do NOT upload this mesh with recolors, link here instead. - Do NOT upload my work or derivations thereof to paysites. Thanks to all the tutorial writers. Thanks to the makers of SimPE and MilkShape, and wes_h and demon (and me!) for plugins. Thanks to HP and all the other makers of untuckable apparel. edit: Just discovered today that BlooM @ InSim also fixed the bone weights earlier. My thread is still useful though since this mesh is untuckable and has a preg morph.